After breakfast in a breakfast room crowded with two tour groups – one British and one French–I headed out to see the Masaccio frescoes from the early 15th Century. 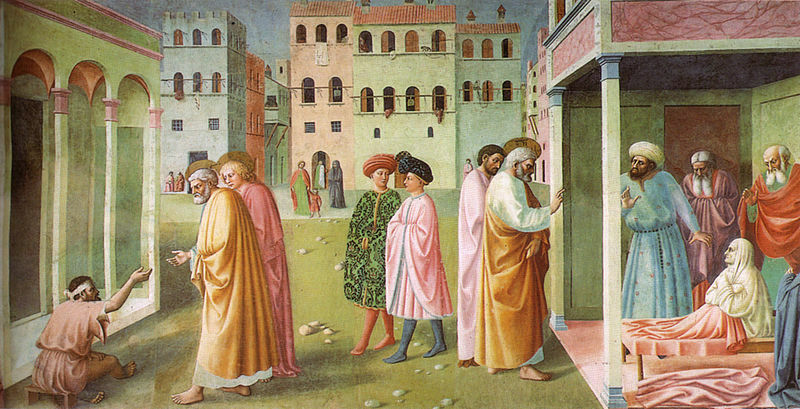 Masaccio is credited with setting the stage for the Renaissance with his use of perspective and the individuality he infused into the people in his paintings. Rick Steves, as usual, includes a pretty good description of the frescoes in his guide book. I liked the faces Masaccio painted – he does capture real emotion much more than was done in the 14th Century. His figures are definitely on the muscular, big boned side. They all look like they’ve spent serious time in the gym, except maybe Peter who features in most of the frescoes and just looks kind of old and careworn. Considering he ends up being crucified upside down—as depicted in one of the frescoes—it’s hardly surprising. The crucifixion scene was painted by Lippi, son of Frau Lippi, the monastic artist who apparently fell in love with and married a nun when in his fifties. So I guess nuns and monks did see something of each other in those days. Plot point? I actually liked Lippi’s crucifixion scene because none of the faces of the various figures—those helping out with the actual procedure (not pretty) and those looking on—look very happy about what they are doing. They all look a bit shell shocked, as if they know they really should be somewhere else and not helping to kill a guy who one day gets a really big cathedral named after him. Probably the best of the frescoes is the one of Adam and Eve as they get expelled from the Garden of Eden. Eve’s expression really defines abject despair. You get the feeling that she really wished she hadn’t eaten that apple. Some of the frescoes are by Masaccio’s teacher Masolino including the one with the famous pair of Florentine dudes prancing across the open piazza. I’ve always liked them! After leaving the church with the frescoes, I actually stumbled upon a real live Florentine neighbourhood—at least for a few blocks before the street ended up across from the Pitti Palace. I then joined the parade of lost looking tourists who had crossed the Ponte Vecchio and were now not exactly sure they wanted to penetrate the forbidding looking walls of the Pitti. It doesn’t look like the most welcoming place in the world. I didn’t go in this time although I would have liked to have time to see the Boboli Gardens again. But instead, I collected my luggage from the hotel and then grabbed a taxi to the train station and went in search of the bus to San Gimignano. But that’s another post.